I do hope that you enjoy this gift of love on the twelfth day of Christmas. It is my desire that these words of encouragement will propel you further down your path of success. Click here for your gift. Over the past couple of decades we have witnessed an increased effort to eliminate the true reason for the Christmas season. Rather than identify Christmas as such, people feel the politically correct word is “holiday”. What is that all about? Let’s view it as Holy-day in its true reflection of Christ. We have experienced an escalation of battles waged to not have the nativity scene or the Ten Commandments in public places, or even on private property. Believers are afraid to display or reveal their affiliations at work because of the perceived separation of church and state that is not a part of our Constitution. More and more we find that our society is moving further away from the Word of God in which this country was founded. In its departure we’ve seen an escalation in crime, divorce and the deterioration of our families, communities and moral attitudes and actions. It appears as though drugs and guns became the substitute when prayer was taken out of schools. We have gradually embraced the opacity in discerning what is good and what is not. Our society finds itself exclaiming that evil is good and good is evil and forcefully defending the misconceptions. During this holiday celebration, I wanted to share that some of the perceived pagan rituals and symbols that for years we thought were just that, are in fact symbols for us to share our Christian faith. Societal propaganda has hidden and muddied the true meanings of these symbols. From the Christmas tree, to the candy cane, to the Twelve Days of Christmas and more we can use them to share our faith to provide hope, healing and life. Just like those who came up with a nonsensical rhythmic song to share their faith hundreds of years ago, we are finding ourselves in a similar situation. Some of the reason is our lack of knowledge when it comes to our unalienable rights as outlined in the U.S. Constitution and Bill of Rights. As a result, it is hard to even help our children understand what their rights are as citizens attending school public schools. Oh yes, they have the right to practice their religion, to assemble and the freedom of speech. If we don’t educate them, which in many instances we don’t because many of us are not aware of our own rights, how in the world can we help them? One feeble woman orchestrated an effort that took prayer out of our schools. Yet, we who serve a massive God has not been able to get prayer back in; not even through the back door by training our children about their rights in establishing bible study and prayer groups. Our tax dollars ensure that they must be given a place to assemble on the school grounds. Most of us don’t know about that. When I embarked on this journey 12 days ago, I did so because my family has been committed to singing this song every Christmas. A few years ago my inquisitive nature caused me to research it to find out its true meaning. I just wanted to share with so many that we can never lose sight about why we celebrate this holiday season. It is more than Black Friday, (for many consumers it’s actually Red Friday). It is more than going into debt buying gifts that you can’t really afford. It has nothing to do with drinking yourself into oblivion. It is more than becoming holiday gluttons when we eat so much we almost burst open. It is so much more than that. Rather than get so caught up in religious dogma that we miss opportunities to share Christ and our faith, let’s be open-minded to truly understand the meaning of these symbols before we simply dismiss them. Let us learn so we can share the gift of life with others. Give someone the gift of true life! It doesn’t matter if it is Christmas or not! God gave it to us through the birth, life and death of His son Jesus. And, what an awesome gift! This is your 12th gift of the 12 days of Christmas. It is my prayer that you have enjoyed these 12 days of Christmas. I do pray that your appreciation for this nonsensical song has made you realize it is not so nonsensical, but chocked-full of meaning for believers in walking in compassionate love in sharing the faith. Each and every day throughout the year, embrace the greatest two commandments to be your guiding force to live out your purpose in the marketplace. We are marketplace influencers on a Kingdom agenda. Allow God to reveal to you who He created you to be and the assignment that He has for your life as a Kingdom marketplace influencer. Please visit our website at www.themeplace.org to listen to the complete 12 Days of Christmas. Have a blessed prosperous year. Special thanks to Dennis Bratcher, CRI/Voice, Institute for excerpts. Visit this site for more in-depth information. I do hope that you enjoy this gift of love on the eleventh day of Christmas. It is my desire that these words of encouragement will propel you further down your path of success. In August 2001, I received these words of faith, walk on the water. Every week since that first occurrence I hear these words and when I need it the most I hear them several times a week. These words have and continue to propel me to operate in faith regardless of what is happening. Without faith you cannot please God because he has given each of us a measure of faith to succeed. Faith comes by hearing the Word of God. It is hard to have faith, if you do not intimately know God’s Word. It is faith that brings into existence your hopes and desires. Many don’t understand the process of faith. We know faith is the substance of things hoped for; so what is the substance of hope? Hope is the trials and tribulations that increase your patience as you experience life’s many twists and turns. It is this hope that never disappoints us as we walk in great faith. Faith is action. Faith is fluid. It is forever moving forward and never moves backward. Faith is the main ingredient to renewing your mind by transforming your thoughts. One positive thought can chase away 1,000 negative thoughts and two positive thoughts can chase away 10,000 negative ones. Transforming your thoughts through positive daily biblically-based aspirations will transform your world. Negative thoughts no longer have dominion over your life as you team up with God to unleash unlimited possibilities. Faith is seeing the unseeable…believing in the unbelievable. It is speaking into existence what the human eye cannot see, but the spiritual eye acutely envisions. Faith breeds miracles. With faith you walk in the realm of miracle-working power every day. It is that same miracle-working power that brought my sister Patricia back from the dead and gave her a second chance. Faith keeps you from attending the pity party, because you always have an invitation at the prosperity party. Faith is the process to manifestation. God provides the vision, but it takes faith to get you to the manifestation of that vision. Faith is what makes you sit down and take a look at yourself to make sure you are still in His will. Being in His will is all about Him and not about you. Once you realize His thoughts are higher than yours and His ways are higher than yours, than you truly can surrender to Him. True, He provides glimpses of your future, but only He knows the complete story. Faith is about trusting Him in such a way that you know that He always has your best interest at heart. On yes, there are times when unpleasant situations may come towards you, but it takes speaking and walking in faith that propels you through them. Faith wards off the fiery darts thrown at you with exceeding joy, peace that passes all understanding and to love those who have waged all manner of evil against you. It takes faith to move forward when devastation hits–rather it is death, joblessness, divorce, strife, confusion or whatever; faith exclaims, I can do it because God says I can do it! Faith is that overcoming power that propels you to live an abundant prosperous life, not just here but for all of eternity. The more you connect your words in prayer it will escalate your faith. When your faith is propelled into another stratosphere, there is nothing that can prohibit you from operating in the miraculous realm of impossibility. Fear of failure immobilizes your faith and paralyzes you causing you to refuse to dream and prevent you from embracing life. How we maximize the “now” determines our success in fulfilling our potential. “Now faith is the substance of things hoped for, the evidence of things not seen.” Potential is the unseen that propels us into the manifestation of our hopes and desires. Everyday (evidence of things hoped for) is the fulfillment of the potential God envisioned before we were born. It is impossible to please God without faith. Our words frame our world and they are a representation of the image we want to project. Our daily vernacular either builds us up or tear us down. Faith words bring life and fear-based ones don’t. It is as simple as that. Never underestimate God. When you do, you no longer defy the gravitational pull of fear with great faith, but you succumb to doubt that inevitably will destroy you. Faith begins in your heart. Out of the heart the mouth speaks. Put faith in your heart with the words that you speak because out of it flows the very source of your existence. Words of faith produces a bountiful harvest of increase; words of fear do the exact opposite. Faith principles rooted in prayer culminates in a new perspective and a winning attitude that translates into winning actions. The valley experience is a death experience. You have to die to the fears of captivity in order to walk on the liberating path of faith. The valley is the battleground of two wills, fear and faith, your decisions and actions will determine which emerges victorious in your life. Fear blinds you to the greatness inside you. Faith enables you to not only see the greatness God saw, but to take bold actions in living the great life God envisioned for you. This is your 11th gift of the 12 days of Christmas. I do hope that you enjoy this gift of love on the eighth day of Christmas. It is my desire that these words of encouragement will propel you further down your path of success. Michael Jackson’s hit single, “Man In The Mirror,” places the responsibility of transformation on each of us, not just for ourselves but our environment as well. The song included the lines, “I’m starting with the man in the mirror. I’m asking him to change his ways. . . If you want to make the world a better place, take a look at yourself, and then make a change.” What a powerful message to propel us to look at ourselves and to make a change. How many of us look in the mirror and see our true reflections? I’m not talking about outward blemishes, but inward character flaws. These blemishes require more than over the counter or prescription remedies. Our looking-glass first and foremost has to be the reflection of the Word of God. When you peer into the Word of God, who gazes back at you? Is the acne of lying, jealousy, selfishness, envy, self-centeredness, hatred, and arrogance ruining your spiritual complexion? Have you noticed any discolorations caused by your lackadaisical attitude and inability to trust in God and step out on faith? Are you practicing a daily cleansing regimen of washing yourself in His Word and exfoliating with prayer, fasting, meditation and consecration? When was the last time you applied the Word of God to cleanse your spiritual pores of all the strongholds that clog them up? Do cakes of makeup prevent you from really getting to know the authentic person created in God’s image? How often do you sift through the looking-glass of God’s Word to remedy the issues that causes unwanted wrinkles from worry, fear and anxiety? There comes a time when you have to make a change. These changes all begin with you. It begins when you take a critical look at who you are in Christ, and begin to apply the true cleansers, purifiers and beautifiers only God’s Word can do. It is then that the image in the mirror illuminates with the glowing power of Christ’s image and God’s glory. Make the change. You’ll be glad you did. The world will definitely be a better place for it. Embracing God’s commandments is the first step towards transformation and changing the reflection that gazes back at you. His commandments always includes loving Him, others and ourselves. You’re responsible for your own actions. No one else is responsible but you. The finger always has to point inward more than outward. God has given us the mandate to subdue, replenish, increase and take dominion in creating a better world for those amongst us and those coming behind us. Our lives are linked to each other as well as our success. We are to treat others as we would like to be treated. That means everyone who comes into your sphere of influence. Being on your best behavior is more than just when others see you, it’s even more important when its only you. If no one else sees you, God does and you see yourself. One thing for sure, you cannot escape you. Put forth effort to make a change every day. The only way true transformation takes place is that you have to make it a part of your daily routine. You have to be committed to change. When you change from the inside out, others will change around you as well. Change is lifelong. It is the constant of life. The more things change the more they stay the same. Change your attitude. Change your world. Improve your circumstances for you and others. Sacrifice and surrender is at the crux of change. The more you sacrifice in a state of surrender, the more you realize that the mandate on your life is bigger than you and exceeds you. This is your 10th gift of the 12 days of Christmas. Do You Represent God Well? The other week I was talking with a young woman and she exclaimed, “God is my source!” I found it quite interesting that she felt the need to make such a declaration. Yet, it conjured up some thoughts for me about people who feel the need to exclaim how God is their source. Interestingly enough the conversation was about her negative behavior. Yet she felt the need to declare God as her source of provision. All too often we want to make all these intimate allegations about our relationship with God. More often than not they are tied to what He can do for us more than how our lifestyles represent Him. Even days later the thoughts kept flooding my mind of the number of people who notoriously exclaim what God is to them, yet their behavior is contrary to their words. The lusts of the flesh are obviously driving their lives more than the fruits of the spirit. Their behavioral witness does not glorify the God they claim to intimately know. What if the declaration was not lip service, but by action and deed? True actions are propelled by love. It is God’s true love that ignited Him to give us His only begotten son that we would have eternal life. He is a God of action. We should be His witnesses of action as well. Our love for Him should be declared by our lifestyles rooted in the fruit of the spirit. Mere words are not actions; they are just mere words. So the next time you use profanity, get drunk, dress a little risqué, mumble and grumble, cause dissension, fornicate, commit adultery, lie, smoke marijuana, rebel against leadership and a host of other things, ask yourself are you being a source of His glory? Then, truthfully answer. If the answer is “no,” then make a decision to truly represent the God that you so eloquently declare is your source. 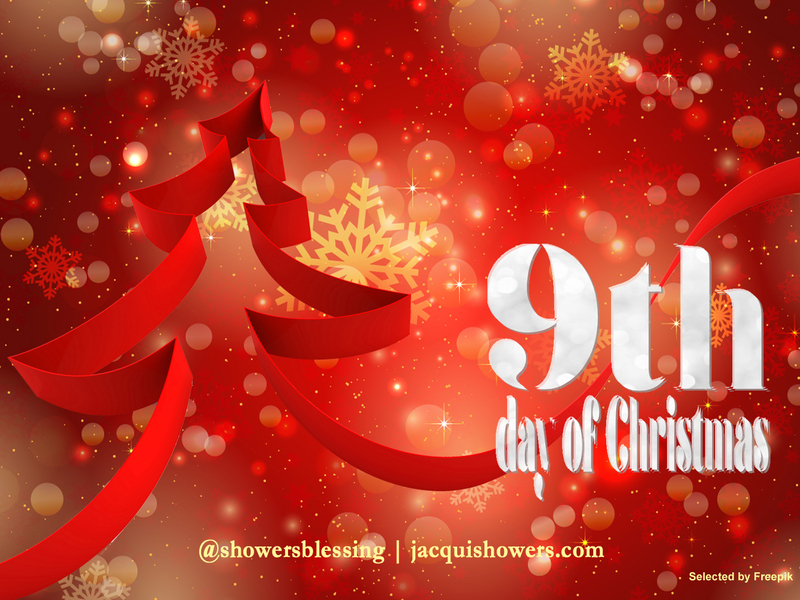 This is your 9th gift of the 12 days of Christmas. In a conversation with my niece she stated, “God is not in everything.” I quickly admonished her and said that everything is all about Him. When you realize that it is all about Him, your life takes on new meaning and your purpose for being becomes even more paramount. The vicissitudes of life can’t jerk you around because you become content in who God created you to be, regardless of your situation. You see, we can never lose sight of the very fact that God is in control. The enemy is so glib in his antics, as he was with Eve, that before we know it we have become ensnared into pride, which leads to becoming more consumed with yourself than you ought to be. Pride is more than arrogance. That is why many of us find ourselves being proud over things that we claim to have done when we know full well that if God had not provided us the wherewithal to accomplish the feat we never would have been able to do it. Then there are those who get so caught up in the “woe is me syndrome” their every waking thought is consumed with themselves and their plight. Not until they can envision more than the pain of life are they able to relinquish the pride of their pain. All God is calling for is a surrendered vessel. It is in this surrender that we not only find Him, but we find ourselves. In finding ourselves, it is not about great exploits of fame or fortune, but it is all about glorifying God. We do that when we seek Him daily. When you begin to lay down your desires to have just more of Him, it is then that you surrender your life to Him. It is then that you begin to trust Him in such a way that it doesn’t matter what happens, because you know that He has everything under control. You are no longer the captain of your ship, but you wholeheartedly relinquish the reigns to God to be the commanding force purposefully guiding your life through its many twists and turns. When tyrannical ideas spring forth, you obliterate them with His Word and move confidently into the expectation He has for your life. Then and only then can He truly use you and you are truly His. You can’t get so enamored with the expectancy of the horizon (good or bad) than you are with the One who created the horizon of expectancyGod’s blessings empowers us in every aspect of our life. This is your 8th gift of the 12 days of Christmas. I do hope that you enjoy this gift of love on the seventh day of Christmas. It is my desire that these words of encouragement will propel you further down your path of success. Your purpose comes from God. No one knows your purpose but God, because He is the one that created you. Seek and ask God what is your purpose. He is the purpose giver and the purpose revealer. Sometimes God is trying to tell us our purpose, but we are too afraid to hear, not to mention to walk in it. Your purpose has nothing to do with fame and fortune, but it has all to do with your obedience to God as you pursue it with passion and fervency. Your purposeful assignment is beyond you. Your purpose is always in a particular geographic location, or locations; and it is always connected to people. God didn’t create us to be alone. It is living out loving your neighbor in serving them with your gifts and talents. Your purpose is revealed to you early in life. Every talent and gift that God has given you is entrenched in your purpose. At some point when you were young, God revealed it to you. If you ask Him, He will take you back to the place of the first mention of your purpose. Your purpose has nothing to do with whether or not you can finance it or not. It is who God has created you to be. When you begin to walk in your purpose, God will do what is necessary in propelling you to achieve it. Your purpose outlives you. The legacy that we leave has more to do with making this world a better place. God instructed us to subdue, replenish, increase and take dominion. Everyone of our purpose should expand the Kingdom agenda in sharing the love of God as we live out the greatest two commandments—to love God with all our hearts, minds and souls and to love our neighbor as we love ourselves. This is your 7th gift of the 12 days of Christmas. One of my favorite childhood movies is Pollyanna. What intrigued me most about Pollyanna was her infectious optimism for life. She was able to infect an entire community and transform their attitudes in spreading a message of optimism and forward thinking. Now that is a great virus to catch and pass along! What better way to kick the New Year off than to make a commitment that no matter what happens in 2016, you will always look on the bright side of the situation. Can you imagine how many lives would be positively touched if all of us decided to provide hope in what many perceive to be a hopeless situation. Every day we’re inundated with one dismal report after another, which can evoke fear and paranoia. Fear paralyzes and prevents you from functioning with unbridled optimism that stops you from moving forward. This is a time to relinquish the haunts of the past and to move confidently forward towards those things that will catapult you to experience success. As of 11:59 p.m., on December 31st, the year of 2015 begins its descent as a distant memory. All that can be done has already been done. It’s left behind with its milestones of memories for reflection at a later time. Once midnight ushers in 2016, new opportunities loom on the horizon. Yes, the nuances of this year will pass from 2015 to 2016. How you allow them to affect your mindset does not have to cross over into the New Year. Operating in the peace and joy of God is what is going to get you through and allow you to maintain a healthy attitude for success. God has prepared us to face the vicissitudes of life with an optimism rooted in His Word. On every page of the Book of Life it insures us that we have a right to an abundant, prosperous, peaceful, joyful life and to experience success in everything we do. I’m infecting others with the life-giving virus of optimism so they can move forward and overcome barriers that have prevented them from accomplishing everything they endeavor to achieve. Imagine if each of us make that same commitment how many negative forces can we put to flight, not just in our own lives and family but our society as well. You’re infected! Infect someone else! Don’t let anything stop you from optimistically moving forward in 2016. Have a blessed, prosperous and optimistically successful New Year! I do hope that you enjoy this gift of love on the sixth day of Christmas. It is my desire that these words of encouragement will propel you further down your path of success. You create your world. Not just for today but for tomorrow as well. If we take our lessons from the Master Creator, Almighty God, we will never go wrong. In the beginning God created the heaven and the earth. How did this creation take place, through words. God spoke it and it came into existence. There is power in the creative forcefulness of our words. There is life and death in the power of the tongue. Positive creativity transforms worlds and lives. Positive creativity is not afraid to look at life as it is, envision how it can be and set out to create a new world. Each of us has a responsibility that when we take our final breath to have made a positive contribution to making this world a better place. That can only come when we tap into the creative energy of our Creator, the Almighty God, in accomplishing the task He has set before us regardless of how impossible it may appear. God has placed skills and talents in each of us. It is up to us to take those skills and talents and use them for the betterment of our families, churches, schools, communities, societies and ourselves. No one can destroy you, but you. No one can create you, but you. God took his words and put them in your mouth and gave us the power to speak into existence those things that be not as though they are. In essence, He provided us the ability to speak so the invisible can become visible. Follow the exemplary example of your heavenly Father and say, “I’ll create me a world.” God empowered you to create a better world when He blessed you with the creative gift of words. Listen to the words you speak. If you speak more negative words than positive words, make a conscious decision to transform your speaking habits. Become conscious of only speaking words of life and not words of death. Complement your positive aspirations with the life-transforming power of God’s Word. As you speak each affirmation you double its creative power by coupling it with God’s Word. Create an environment to speak only creative words by putting positive affirmations throughout your house. Don’t just walk by them, but speak them until they become a part of your very existence. Include positive aspirations in your cell phone to keep you motivated throughout the day. Remember to complement them with a scripture. Throughout the day meditate on them and watch how prosperous your life becomes. Be careful of every idle word you speak. Refrain from saying things like, “I’m so stupid. I can’t learn that. You make me sick.” It may seem as though you are just merely saying words, but words have power. Transform your thoughts. You transform your heart. You transform your words. Out of the heart the mouth speaks. Always remember that life and death are in the power of the tongue. Allow your words to be a life-generating force that creates a world you never thought imaginable and for others as well. 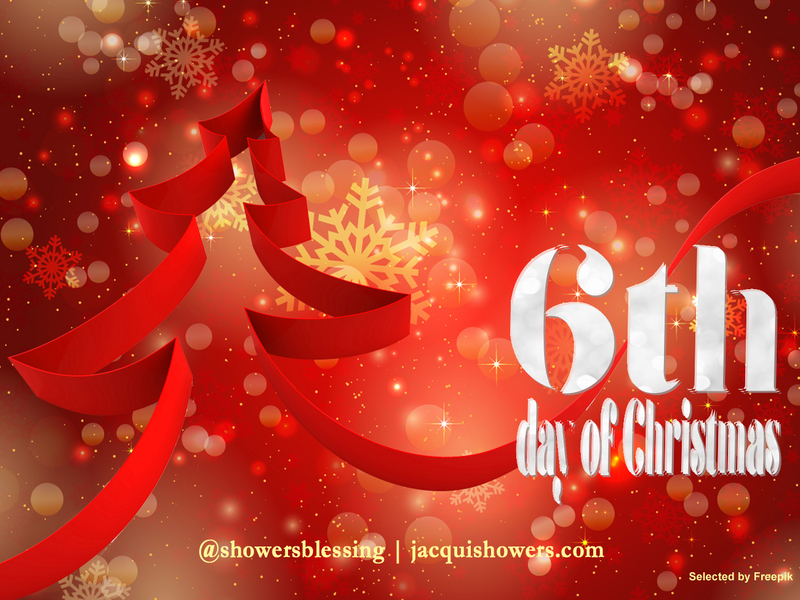 This is your 6th gift of the 12 days of Christmas. I do hope that you enjoy this gift of love on the fifth day of Christmas. It is my desire that these words of encouragement will propel you further down your path of success. We are the love-lights that have been sent into the world to brightly illuminate in the marketplace every single day. Most notably, we are being sent into our respective workplaces to be those shining lights drawing people to God. A light gives off warmth. It is not dull, but brings illumination of the liberating power of God’s Word. As those love-lights every dark place we enter into the atmosphere is transformed. It is not about being a Bible-thumping zealot, but it is to exhibit compassionate love to all that comes into our sphere of influence. In the 21st century, we have to be even more vigilant in spreading love and good cheer in our respective workplaces. People need the Word and they want it, even though sometimes they act as though they don’t. Those five golden rings of the Pentatuch begins with Genesis where God creating man in His image and breathed the breath of life in him. God went even further to instruct humankind to subdue, replenish, increase and take dominion of the earth. Even though man faltered in the process, God had already created a plan to reconnect man back to Him. In these five books, God outlines in meticulous details every blessing for us to increase in wisdom, understanding, counsel, might and knowledge as we give reverence to Him and lead by the Holy Spirit. There is nothing that God would not do for us and would not give us. He has placed so much greatness inside of each of us to become everything He envisioned so we could experience what God saw—spiritual, abundance, wholeness and wealth. Obey God’s commandments. When you obey God’s commandments there are always corresponding blessings chocked-full of opportunities that manifests in your life. Believe in the veracity of God’s Word and use it every day to transform your mindset to overcome a life of limitation and embrace an abundant life of prosperity. Establish a life of prayer and fasting. There is no other way to become more in tuned to what God has for your life. These two disciplines, when coupled together, enable you to overcome negative strongholds and habits that have prevented you from experiencing success. Don’t just be a hearer of God’s Word, but be a doer as well. Your success is sealed when you augment God’s Word with your corresponding actions. You have to do more than just repeat it, but you have to live it out every day. Without faith you cannot please God. You should be increasing in faith every day. The only way you can do that is through studying his Word, praying and fasting as part of your daily and weekly regimen. This is your 4th gift of the 12 days of Christmas. I do hope that you enjoy this gift of love on the fourth day of Christmas. It is my desire that these words of encouragement will propel you further down your path of success. The priceless gift of God’s love when He gave His Son so we could experience life to its fullest and have eternal life is priceless—it is unquantifiable. I believe with all my heart that God wants us to use every talent and gift He placed in each of us to make this world a better place. Jesus stated that He came that we would have life and have it more abundantly. I do believe with all my heart we must tap into the well-spring of talents and gifts that God has given us to succeed. The four gospels echo of the unending love God bestows on us every single day. It began with His Son’s birth and culminates in His resurrection. It cries of His faith in His Son and His faith in our believing in the liberating possibilities His Son has given from the manger to the cross. You don’t want to squander the priceless gift of your future. Regardless of who you are or your perceived plight, there is so much greatness inside of you to be unleashed. Don’t allow the temporal forces of this world to prevent you from moving forward. All you have to do is tap into the wellspring of greatness inside of you and experience the fullness of life God envisioned. He wants you to have a spiritually abundant whole and wealthy life every single day. The beauty is that there is nothing in this world to stop you. Nothing can prevent you from experiencing this gift of love that continues to give even beyond your last breath. This is your gift 4 of the 12 days of Christmas.